In the September 2015 issue of the consumer magazine Which? I came across the following description of a pre-paid Mastercard from Revolut. I decided to sign up to see how well it worked. Here is a report on my experience so far. 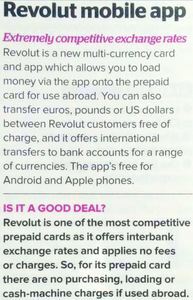 Summary: Revolut usually works. Sometimes it is declined for online purchases. Better documentation is needed. 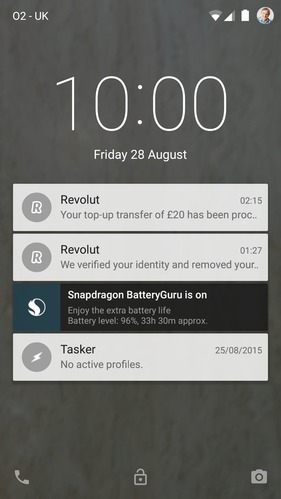 Revolut only operates as an app on a smartphone (Note 1), so I installed it on my Android Nexus 5. As an experiment I decided to create an account, load £1 into it and then extract the £1. The first step was to create an account. To do this the app asks one to choose a PIN and supply a phone number. It then sends an SMS text with a security number to enter into an in-app field. However, when I tried to read the text by switching to the SMS app on my phone, the Revolut app reset and the field into which the texted security number should be inserted vanished. 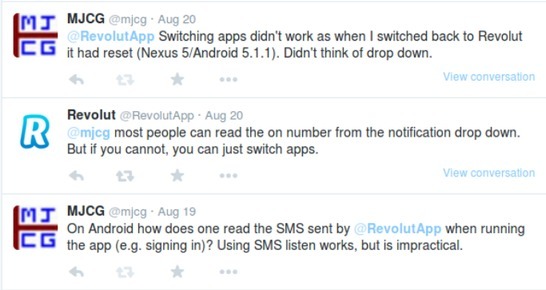 I contacted support using Twitter (read the tweet histories below bottom-up). Fortunately, as mentioned in my first tweet, I managed to work around the problem that switching apps resets Revolut by installing SMS Listen on my phone. 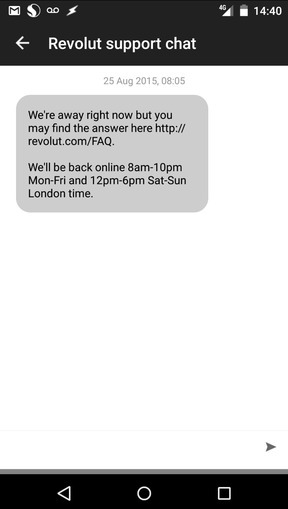 This speaks SMS messages, and allowed me to get the texted number without switching away from the Revolut app. Using the security number got this way, I created an account and transfered £1 from my bank account to my new Revolut account. 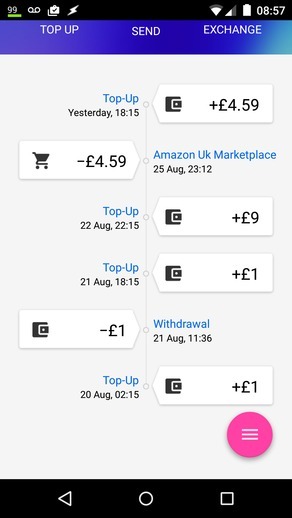 This worked fine and within a few minutes my Revolut app was showing that I had £1 to spend (Note 2). As a next experiment I tried to transfer the £1 back to my bank account. This raised an error message, so I contacted Revolut support again, using twitter. They tweeted a reply announcing both an update fixing the SMS problem (Note 3) and also asking me to contact "in-app support" regarding the error I got when trying to withdraw my £1. Fortunately, one usually eventually gets an email reply that reveals an email address that one can use to start a conversation. To clarify my problem, I used such an email address to send the following message, which included a screenshot of my phone showing the error I got when I try to use SEND in the app to transfer money. However, it turns out that I shouldn't have been trying to send money to myself, rather I should have used the Withdraw option. I'm pretty sure that I didn't enter "incorrect bank details"! 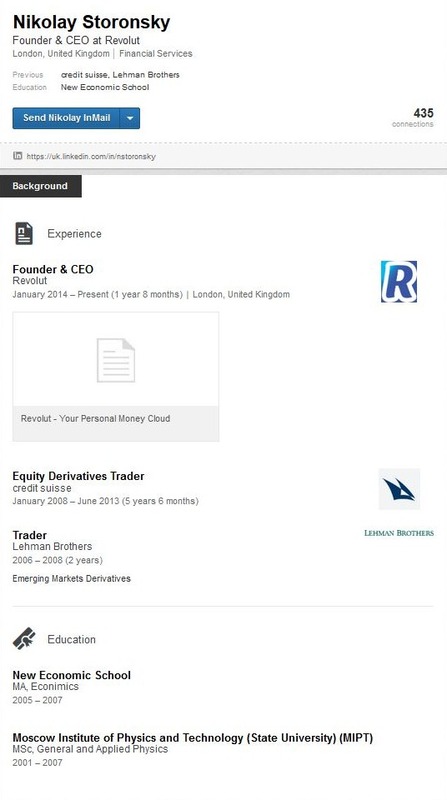 I Googled around and discovered to my surprise that the Nikolay who had responded to my support request is listed on LinkedIn as the "Founder & CEO" of Revolut. Here is a screenshot of my phone showing the "Withdraw button" that Nikolay mentioned in his email. Nikolay's suggestion that I use "Withdraw" rather than "SEND" worked in that the app didn't generate an error message. However, although the £1 was deducted from my Revolut account on Friday 21 August, it didn't show up in my bank account by the following day. I contacted support again and this time I got a reply from a Vladyslav Yatsenko. The payment actually arrived Thursday 27 August from The Currency Cloud. It turns out that, according to LinkedIn, Vladyslav is the CTO of Revolut. I'm not sure what to make of getting support from both the Founder & CEO and the CTO: is this good or bad? I decided to try another experiment: use my Revolut card to buy three Rollerball pens on Amazon for £4.59. First I topped up my Revolut account with sufficient money. Next I tried to add my Revolut card as a payment card in my Amazon account. There isn't a "Cardholder's Name" on the in-app version of the Revolut card (my plastic card hasn't arrived yet). I've edited the screenshot below to remove the card number and CW number. Unfortunately, Amazon complains if one leaves the Cardholder's Name blank. I tweeted to ask if a Revolut card could be used for Amazon purchases and got a positive answer. 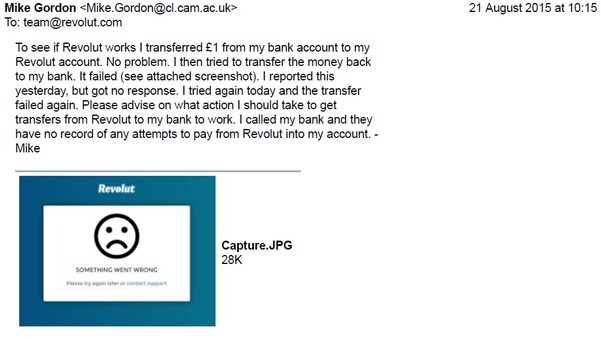 and eventually got an email reply telling me to use the name and address associated with my Revolut account for the "Cardholder's Name" and "Billing Address" when adding the Revolut card as an Amazon payment card. This works, and I successfully ordered the pens. 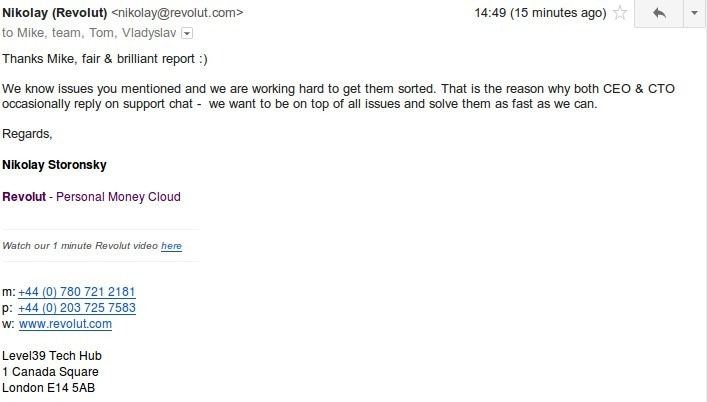 In parallel with tweeting Revolut, I also asked Amazon support if they accepted Revolut. 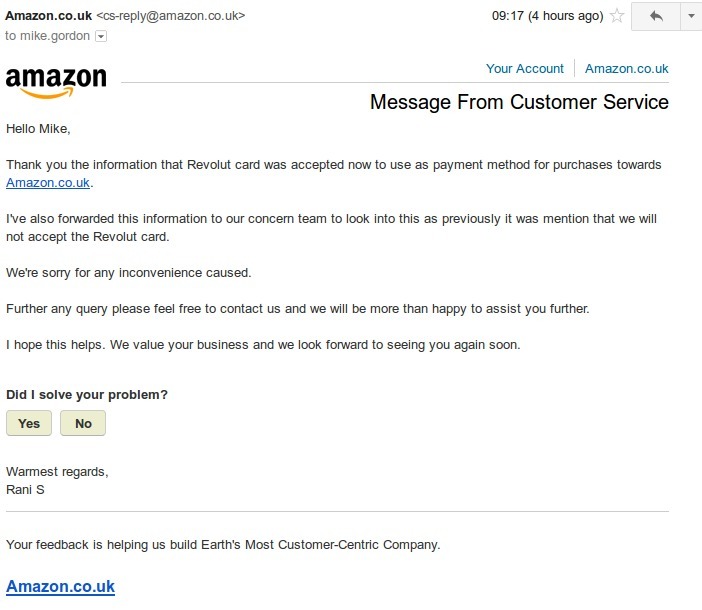 Amazon support said they didn't accept the Revolut card! I hope that Amazon and Revolut support will get in sync ... however, my Rollerball pens have already been shipped! My Revolut card arrived on Thursday August 27. I was able to withdraw all the money in my Revolut account (£10) at a Sainsbuy's. 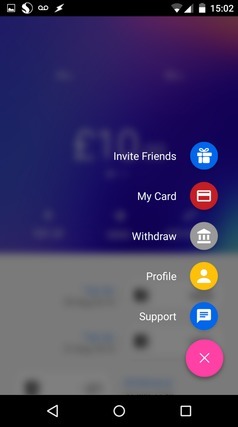 According to the settings page in the Revolut app, one can only deposit £1000 per year if ones identity is not verified (it's claimed that this is because of banking regulations). Whilst £1000 should be plenty if I were just using the card as a travel card, I am also thinking it might be a way to transfer money to family members resident in the USA. Although a bit worried by identity theft, I decided to get verified. Clicking on "Verify Identity" in the Profile page of the app results in one being offered three verification methods: passport, driving licence, or ID card. I opted for using my driving licence (I was thinking that stealing my identity via this might be harder than via my passport data, but this may be naive). 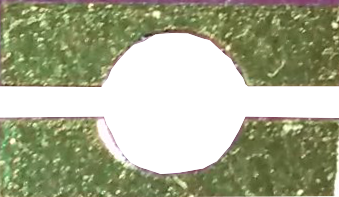 Selecting the driving licence option results in the camera being switched on with the view overlaid with a frame containing an outline head. There were no instructions, but I guessed that I should point the phone at the card part of my licence, aligning it with the frame in such a way that the outline head is filled with the photo of me on the card. I did this, but nothing happened. I tried a few times, each time attempting to get the card better aligned with the frame and my card picture in the indicated place. Eventually I gave up and switched to using my passport. The procedure with a passport is similar: one points the phone camera at the passport page so it fills a frame hopes the app will capture the information it needs. This worked and next I was presented with a rather confusing screen that asked whether my passport had an ePassport symbol or not on the front (mine does). If "Yes", the instruction is to click and then lay the passport on the phone and wait (presumably so it could read the chip in the passport). However, there were more than one occurrences of the ePassort symbol on the page and I spent some time clicking the wrong one. Eventually I realised it was the symbol at the bottom of the screen that should be clicked (confusingly located below the "No" ePassport option). I clicked this, put the passport on the phone and apparently the right think happened because I was taken to a screen that wanted to verify my face. This works by switching the phone camera into selfie-mode (i.e. using the forward facing camera) and then instructing one to look at it, aligning ones face with an outline face overlaid on the phone screen. I did this. The image jiggled a bit, but nothing seemed to happen. Whilst trying to allow the app to verify my face I noticed a message on the screen, which I couldn't read as I had taken my glasses off (since I thought the image of me stored in the passport chip was without glasses). I put them on, but then an error popped up, but then disappeared too quickly to allow me to read it. Maybe I should have waited a little longer. The app then indicated that it was processing my identity data and would email me the result, saying something like "usually within 15 minutes". It's now hours later and I haven't got an email! Under "Verify Identity" in the Profile screen of the app it says "Processing". I sent a support email (no reply yet), but found the next morning that "Processing" had changed to "Verified". Success! I must remember to memorize my card PIN down before travelling! 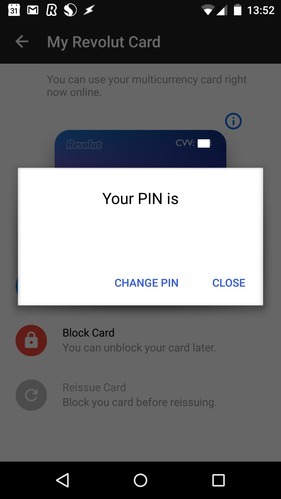 Some days after writing the above I noticed that after clicking "Show PIN", the Revolut app provides a way to change the PIN associated with the card. I used this to change my PIN and then went to a nearby cash machine and successfully withdrew £10. I had thought that a card's PIN was stored on the card itself and that cash machines verified the PIN that a user keyed into the machine by comparing it with the PIN stored in the card. However, this can't be the case since I didn't touch the card when updating the PIN using the app on my phone. 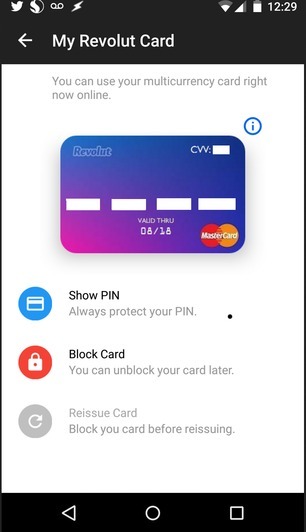 Presumably Revolut has set things up to allow PINs to be updated by cash machines. Update on 24-09-2015. 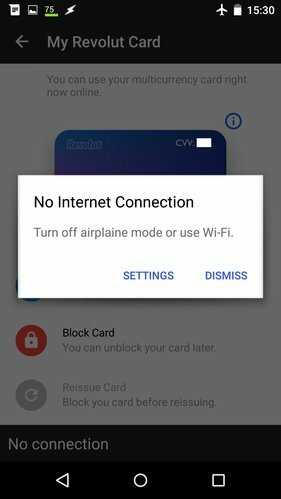 I suffered my first failure of a Revolut payment yesterday: a mobile phone PAYG top-up was declined by O2. I tried to do the top-up twice, both declined, and then I successfully topped-up with a Visa credit card. I used the in-app support to notify Revolut and got an immediate reply apologising and saying that they would look into it; however, so far (two days later), I have not heard back. The Revolut card still allows cash withdrawals from an ATM: I just withdrew £20 from a nearby machine. I successfully topped-up a PAYG phone on 3 (Three.co.uk) using Revolut, so it seems there's a problem with O2 rather than mobile top-ups in general. Update on 15-11-2015. The O2 problem never got resolved. However, I've used my Revolut card successfully several times since the last update for a variety of small payments and cash withdrawals. It usually works, but not always; for example, a payment to nannamexico.com failed (they use securetrading.com). Update on 31-12-2015. I got an email asking if my Revolut card works abroad. I'm currently in the USA and have used it in shops and a restaurant without any problems. I haven't yet tried withdrawing cash from an ATM. Since am posting this on public websites, as a courtesy I emailed an early version to the Revolut people who had sent me support emails. I found that the Revolut app can also be run on my Windows laptop using the BlueStacks Android app player. The updated Revolut app shows the texted number in an automatically appearing drop-down box. The other option for topping up Revolut is to use a credit card, but I thought that giving Revolut my bank account and sort code was safer than giving them credit card details. Not being a security expert, I don't know if this was actually a sound decision though.